Please join us for a New Perspectives tour of the fourth New Museum Triennial, “Songs for Sabotage.” On this tour, we will examine how selected artists employ various media, including archival footage and architectural forms, to reconstruct historical events and personal memories. We will consider how artists like Tiril Hasselknippe, Zhenya Machneva, Haroon Gunn-Salie, and Lydia Ourahmane reconstruct the past through immersive multisensory environments, coded imagery, and abstract gestures. What does each artist’s set of choices say about the purpose of representing the past? Do these artists seek to preserve, recontextualize, or both? Finally, we will consider what it means when these reconstructions incorporate elements of incompleteness or deliberate degradation. New Perspectives tours are led by the New Museum Teaching Fellow, an emerging scholar in art history or a related field. 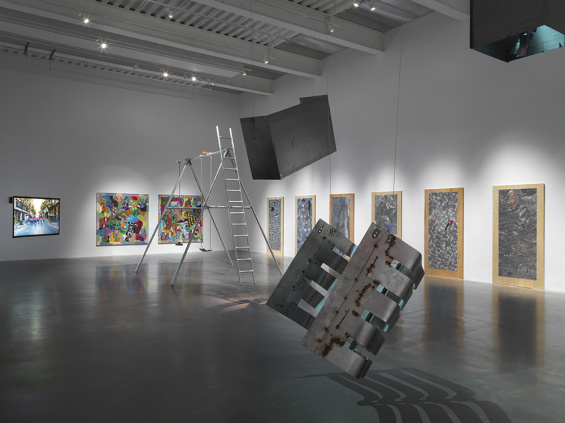 The topics of the tours are based on the Fellow’s ongoing research and change monthly, engaging participants in uniquely focused examinations of selected objects and installations. To read descriptions of current and upcoming New Perspectives tours, please view the calendar. New Perspectives tours are free with Museum admission. Due to limited capacity, please preregister and meet in the Lobby at the time of the tour.